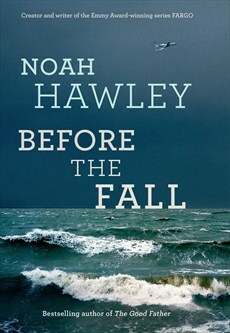 Noah Hawley has written a number of novels but is probably best known as the writer of the television reimagining of Fargo. While Fargo lives in the American mid-west, in Before the Fall, Hawley is mainly concentrated on the East Coast, the lives of the mega-wealthy and the people with whom they come into contact. But Before the Fall is many things – a mystery and a thriller, a meditation on fate and a critique of modern media. Before the Fall opens with a plane crash. David Bateman, head of a FOX-like 24-hour news and opinion network is flying his family home from a holiday in Martha’s Vineyard on a private jet. Also on board are his personal security guard, another wealthy couple and a struggling artist, Scott Burroughs, who has been offered a lift to New York by David’s wife Maggie. Eighteen minutes later and only Scott and the Bateman’s four year old son JJ are alive, adrift in the Atlantic Ocean. The thriller element comes as Hawley explores the aftermath of the crash. Scott, who manages to rescue both himself and JJ, is caught up in a media and legal storm as people search for answers. And when those answers are not immediately forthcoming, those same people start to make them up, fitting solutions to their own theories and biases. The tension here is that, as a mystery reader, we too, want there to be a neat explanation. And as the circumstances slowly become clearer it is tempting, like the press and the FBI, to try and second-guess the reason behind the plane crash. And Before the Fall is a great mystery story. As the lives of the passengers and crew are revealed and parts of the plane are recovered from the depths the mystery deepens. Scott’s battle against the expectations and opinions projected on him, while a little naïve, takes readers into the heart if the storm. And the solution when it finally comes is satisfying both in its construction and its delivery. But Hawley is not just interested into the aftermath. He is also interested in the lives and circumstances that brought those eleven people to that place at that time. As he says “Everyone is from someplace. We all have stories, our lives unfolding along crooked lines, colliding in unexpected ways.” Each of the passengers and crew and their histories are explored, giving Hawley a wide canvas for social commentary. So that this is much more than just a mystery story. Hawley tackles, among other things, the rise of opinion-based news, the nature of art, the culture of the global elite, telephone hacking and privacy, and the hypocrisy of people getting “back to basics” (the word “artisanal” is given such a workout that it feels faintly derogatory). Before this novel appeared Hawley may well have been better known as the writer of Fargo. But after Before the Fall, the medium for which he is better known may well be harder to call.